Bank of the Philippine Islands (BPI) is delaying its imposition of P50 to P100 fee for over-the-counter (OTC) withdrawals and inter-region deposits to January 2019. Two days ago, BPI sent an advisory that this policy will start in September only to take it back. Inter-region deposits are transactions where a client deposits into or withdraws from an account registered in another region. 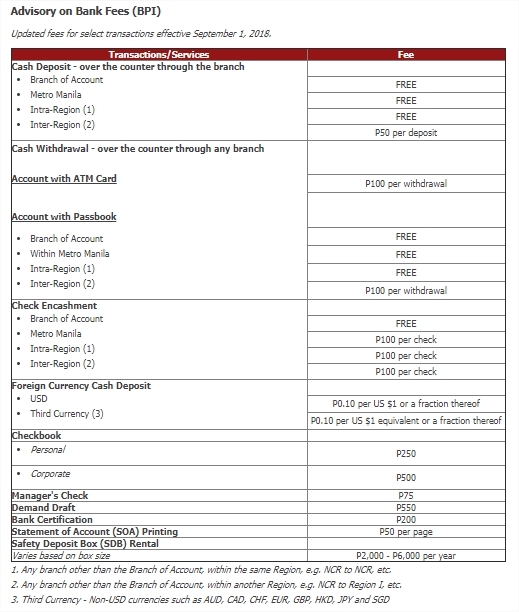 However, it must be noted that the fee for the OTC withdrawals applies to those whose who have an ATM Card account or non-passbooks. Regardless of the amount, BPI will charge P100. They will also ask for a hundred bucks from passbook holders who would have an inter-region withdrawal. Regarding checks, it’s recommended to get them encashed in the home or issuing branch. Outside that, BPI will charge P100 per check. The BPI fiasco is just a system glitch, but how do you protect your bank account from hackers?